Student persistence can increase by up to 15% when students share key aspects of their academic and financial record with parents. CampusESP sponsored a quantitative analysis of student persistence at Abilene Christian University. The research was summarized by Kayla Reed-Fitzke, a PhD in couples and family therapy from the University of Iowa, who has also authored other related studies such as Helicopter Parenting and Emerging Adult Self-Efficacy: Implications for Mental and Physical Health (2016) and Nick Peterson, Director of Analytics at Abilene Christian University. Student Persistence Increases with Parent Engagement features findings based on 993 students enrolled in the study at Abilene Christian University (ACU) in the Fall of 2016. Results showed that 82.5% of the 396 connected students persisted to the second year of college. In comparison only 72.4% of the 597 students who were not connected to parents persisted. 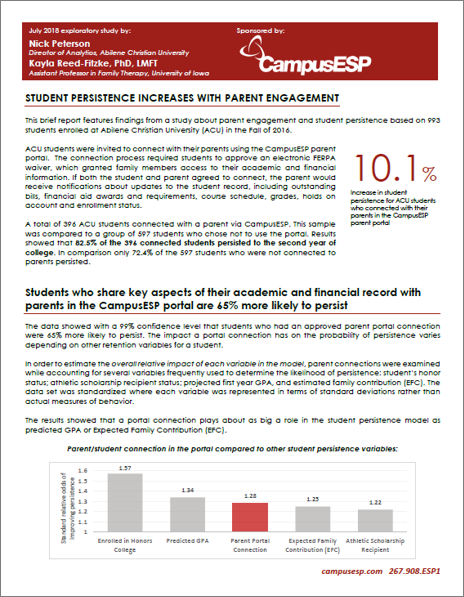 The results also showed that a student-parent portal connection plays about as big a role in the student persistence as predicted GPA or Expected Family Contribution (EFC). To control for extraneous factors that impact persistence, 114 individual variables were run through a multi-directional stepwise logistic regression model. These variables were used to create a base model to control for factors known to effect student retention. The analysis helps dispel the notion that parent involvement is bad. Parent and family involvement is crucial when it comes to student success. NOTE: A complementary study was also conducted in 2017 at Tarleton State University which showed that students whose families are involved with academic support are more likely to persist. The study is available HERE.